The International New York Times-affiliated daily The Express Tribune, published in Pakistan, published an article on November 8, 2014, titled, “Evolution 101: Genetic evidence says cows and whales are related, says doctor.” This article in response discusses the logical inconsistencies of some of the claims and unscientific interpretations in that article. Whales live in the sea and are the largest mammals on earth. Their metabolisms and reproductive, respiratory, sight, hearing and circulatory systems are unique to them and totally different to those of all other sea dwellers. 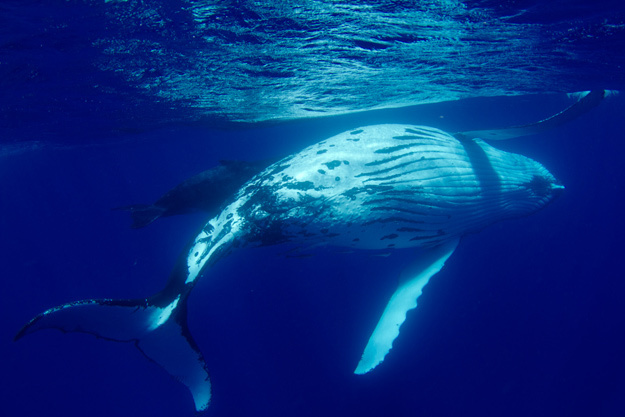 These differences have always represented an important problem for evolutionists, meaning they have been unable to postulate family ties between whales and other marine creatures. Darwinists, who on the basis of their theories need to find a terrestrial ancestor for marine mammals, have proposed various “hypothetical ancestors” in the light of certain limited similarities and made various hypotheses about them. The ‘ancestor’ in the article in question is the cow. First and foremost, there is no scientific evidence for this claim, for example, nothing in the fossil record . The search for evidence over the last century and a half has borne no fruit for Darwinists. Indeed, fossils refute this claim of a ‘family relationship’ between cows and whales. For that reason, Darwinists have turned their attention to genetic similarities and have suggested, on the basis of some of these, that the relationship in question has been ‘confirmed mathematically.’ This is completely false and groundless. The bias in this popular evolutionist tactic here is also noteworthy. ‘There is genetic evidence to confirm this hypothesis.’ What is needed, instead of saying, “There is a genetic evidence that suggests this,” is for that evidence to be revealed but no concrete evidence in favor of this claim is produced. Instead, heavy emphasis is laid on assumptions in order to concoct a resemblance between the species. Of course, when compared at the molecular level, similar molecules are used for similar metabolic events between different species. There may be a higher or lower level of difference between the genes that code these, and this can lead to significant differences between life forms. Yet Darwinists depict this as a trivial matter, or else deliberately ignore it. Formulae set out on the basis of evolutionist prejudices and mathematical calculations formulated to support the idea of evolution are intended to show what kinds of changes may take place for a genetic code to turn into a target genetic code and what kind of time frame might be required. It is therefore assumed that various base pairs making up the initial DNA either disappeared or developed over the course of thousands or millions of years, and the time required for conversion to the target DNA is thus calculated. The only limit, of course, in establishing familial relationships between two life forms using this method is ‘the power of the imagination.’ Accordingly, the number of mutations and the millions of years it takes for a porcine insulin gene to turn into a human insulin gene is imaginatively calculated in a computer environment. Calculations produced ‘mathematical’ and ‘statistical’ methods in this way are of course purely speculative, and not really scientific at all. The use of mathematical and statistical techniques does not bestow any scientific quality on Darwinist claims. Such endeavors are simply efforts to corroborate evolutionist prejudices using sleight of hand. What Darwinists need to do is to corroborate their claims through such branches of science as paleontology, microbiology and genetics, rather than wasting time on speculation. However, the fact that paleontology shows that no such transition as evolution happened is dismissed by evolutionists, and the fact that biochemistry shows that not one single protein can form by chance is certainly no obstacle to Darwinist fantasies. In the absence of any scientific evidence, they resort to fantasies based on calculations they produce while sitting at their computers. The endeavor to equate life forms with one another on the basis of prejudices concerning their DNA is a purely ideological one. There are huge differences between whales and the land-dwelling mammals proposed as their ancestors in terms of basic physiological characteristics such as water conservation, vision and communication. What one would expect Darwinists to do is to use science to explain the scientific dilemmas deriving from these differences and to produce evidence for the hypothesized transition from one life form to another in the light of the claims of evolution. (For further detail see http://www.harunyahya.com/en/NetCevap/148106/the-myth-of-the-evolution) However, they are unable to do that, because all branches of science show that all life forms come into existence fully formed. Some 500 million fossils also show that life forms have come down unchanged to the present day. Science refutes Darwinism. Anyone investigating the universe in an unbiased manner using scientific methods will immediately see that and come across the proofs of Creation.